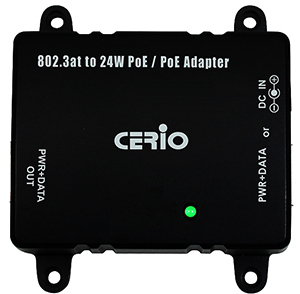 Cerio POE-STG adapter effectively allows any PoE device to become compliant with 44~57V 802.3at PoE standards.This conveniently standardizes power management of your system by introducing compatibility of passive PoE devices with standard 802.3at switches. POE-STG hardware design includes two 10/100/1000Mbps gigabit Ethernet ports,and one DC power input jack. POE-STG adapter effectively allows any PoE deviceto become compliant with 44~57V 802.3at PoE standards. This conveniently standardizes power management of your system by introducing compatibility of passive PoEdevices with standard 802.3at switches. POE-STG’s hardware design includes two 10/100/1000Mbps gigabit Ethernet ports, and one DC power input jack. *The Gigabit PoE must use a Cat 6 Ethernet cable to meet the 100Meters PoE distance. POE-STG is perfect for transforming Cerio access points that use a passive PoE design into 802.3at compliant devices. Other applications also include deploying passive PoE IP cameras with standard 802.3at PoE switches. Users can optionally select whether to use a PoE PD or DC power adapter as the power source, with both methods providing passive PoE output for APs and other PoE devices. POE-STG can provide both gigabit data and power for distances of up to 100 meters (328 feet) from the power source when using CAT 6 cabling.